The Greek goddess Athena has decided to find adventure and challenge in the mortal world. She finds herself in a post-apocalyptic world full of criminals, mutants and destruction. So off she goes on a mission to clear away the evil that is destroying the Earth. This is a flip-screen platform shoot-'em-up with power-ups. The game is a little slow and the graphics look blocky and garish. Sound-wise, a basic tune plays on the options screen with a few effects during the game. There's nothing special here in this game to keep you interested. Seven favourite pub games – darts, billiards, dominoes, table soccer, pontoon, poker and skittles – are brought to you on the CPC. All of the games require you to play with a friend; you might want to take control of both players, but it's nowhere near as much fun. As for the games themselves, they're mostly average, with darts and skittles being the best ones to play. 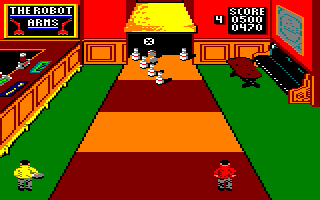 The graphics vary considerably, but sound effects are mostly absent, although there's a nice little tune on the menu. If you have someone else to play against, it's fun for a while. In this game, you play either Puffy or Pufyn, who must make their way through 34 dungeons filled with traps, monsters and treasure. 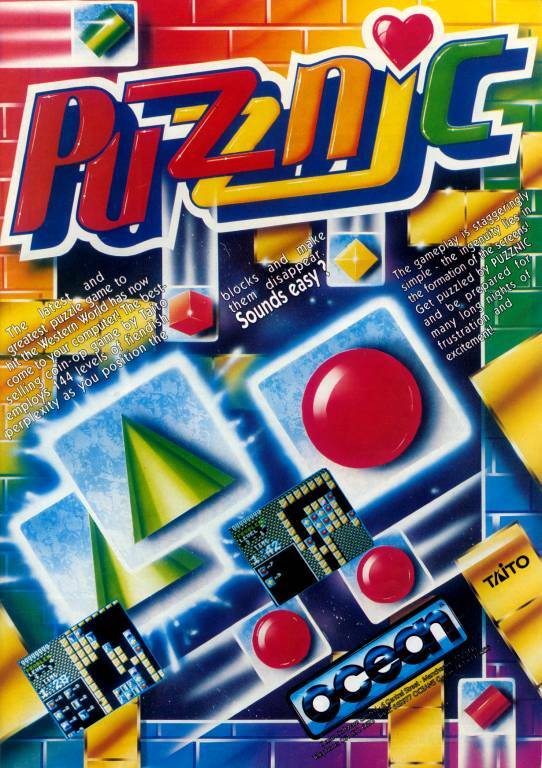 The game itself resembles a mixture of Gauntlet (monsters, keys and magic items) and Pac-Man (collect all the dots to exit). There are larger blue dots to be found that assist your quest; the more you collect, the better the bonus or power-up you will receive. Graphically, Puffy's Saga looks very nice, with no flicker and acceptable scrolling. Music plays on the informative title screen with a few in-game sound effects, including digitised sounds on 128K machines. Pulsator is a puzzle game in which you travel around a flip-screen maze looking for the exit. Certain parts of the maze are blocked by locked gates; each one is numbered between 1 and 6. To open these gates, you have to look for and travel over a numbered tile found within the maze. Retracing your steps over the same numbered tile closes the gate. 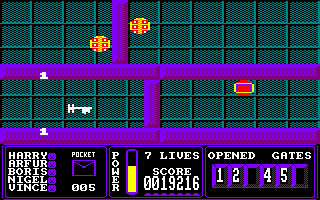 Certain parts of the maze are one-way routes and many instant death tiles act as walls in places. Several nasties occupy the maze and drain your energy if touched, but thankfully you can shoot them down. Colourful and smooth graphics, simple effects and a nice tune add to a very challenging game. It's Breakout time once again, although I have to say that I actually like this one a bit. Instead of a ball, though, there is some sort of laser pulse which bounces about the screen, and if it collides with one of the creatures that roam at the top of the screen, it splits into two pulses, and if there are lots of creatures, there are going to be a lot of pulses, and things get quite hectic! Fortunately, there are plenty of opportunities to get extra lives, and you'll need them. The graphics are nothing special, but the gameplay makes up for it, and you must listen to the music... it is truly excellent! 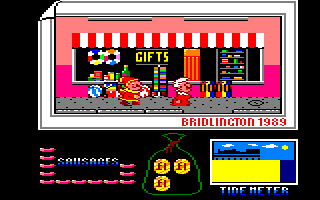 Punch's stall has been dismantled and the pieces are scattered all over the seaside resort of Bridlington, with all its tacky cafés, shops and amusement arcades. You've got to find all the pieces and then find the cast who are also wandering the streets, before the tide comes in. Don't run into Mr. Policeman, though, or you'll be arrested! When you've done this, the show starts and you have to hit each of the cast repeatedly, again avoiding Mr. Policeman. The graphics aren't bad at all, but there are very few sound effects, and it becomes very boring as you wander the streets looking for the cast members. 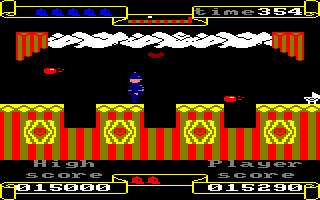 A total rip-off of the 1983 arcade game Hunchback, the aim of Punchy is to get to the left of the screen to the right, avoiding boulders and holes on the way. Once Punchy achieves his aim, it's on to the next level. And... that's it – really! Zero marks for the storyline! Anyway, the graphics are, to be honest, appalling (it was an early game, but still...), the sound is nothing special, and the difficulty veers crazily from absurdly easy to impossible (I mean this literally, as the level I'm stuck on has a huge pit, two ghosts and no way of getting across). Still, for all its negative points, it is still quite a lot of fun and is also quite addictive. Just don't expect to be blown away by it! 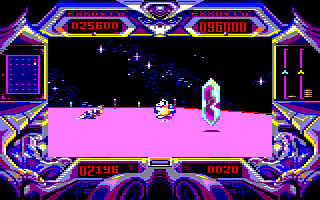 Seven alien contestants and one human contestant (that's you) are about to participate in the Purple Saturn Day games, which consist of four events – Ring Pursuit (a high-speed slalom race around Saturn's rings), Tronic Slider (a bit like ice hockey), Brain Bowler (a very original game in which you attempt to light up chips on an electrical circuit), and Time Jump (collecting sparks of energy in the hope that you can travel through time). The graphics are of an extremely high standard, and all of the events, with the notable exception of the Time Jump, are great fun, although it will take some practice to master them – especially the Brain Bowler! My only complaint is that there is no two-player option. If brain-teasing puzzles are your thing then you'll like this. It simply involves matching tiles with the same pattern on them together, and making them disappear. The difficult bit is that there is also gravity, and you might move a tile into a place where it's blocked and can't be matched! 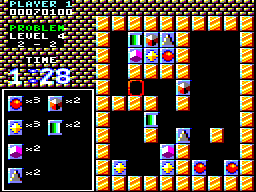 Additionally, later levels require you to remove three tiles at a time. Another nice feature of the game is that you can choose several routes – if you have trouble with one set of puzzles, you can try another. The excellent graphics add to the appeal of this great game.